Penzie was my Great - Grandmother. She married George Byron Norton on Feb. 13, 1892. The entries in the book were made in the 1880's. Most of the individuals who signed were from the West River, Cornwall, and Charlottetown area, and were relatives, family friends and neighbours. Old family photos and documents are precious! This photo shows some of my Great-Great Grand Father, Samuel Hyde's family. Left to right - "Bertie" Hyde 1868-1949 my G-G Aunt, wife of Fred Smallwood, ["Joey" Smallwood (the last "Father of Confederation")'s uncle], George Byron Norton 1866-1949 my Great Grand Father, Matilda Adelaide Hyde 1864-1914 my G-G Aunt who married James D. MacMillan, Gertrude Penelope PENZIE Hyde Norton 1870-1943 my Great Grand Mother, wife of George BYRON Norton, and George Albert Moore, Samuel Hyde's adopted son. 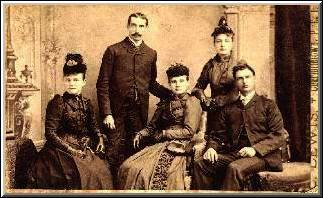 The Hyde family lived in Meadowbank, P.E.I., while Byron and Penzie (back row) made Charlottetown their home. In the chain of friendship, regard me as a link - Annie B. Cowperthwaite. May the wings of innocence and love protect well - Bertie (Hyde) [later married Fred Smallwood, Joey Smallwood's uncle]. Dear Penzie: Strive to heed the Golden Rule and learn your lessons well at school - H. C. Crosby, Cherry Farm, Xmas, 1882. To err is human to forgive divine - Nellie Lawson, Charlottetown, June 30, 1885. Pleasures are like poppies spread. You seize the flower its bloom is shed. Or like the snowfall on the river, A monument - white then melts for ever. - Mary P(oint) Farm, Dec 30, 1882. Dear Penzie: Receive my instruction and not silver and knowledge rather than choice gold. - Mrs. Samuel Howard, Cornwall. Friend Penelope: Leave God to order all thy ways, And trust in Him whatever betide, Thou'll find Him in thine evil days, Thy all-sufficient strength and guide. Who trusts in God's unchanging love, Builds on a rock that can ne'er move. I remain, with love, - Bessie J. Gill, York, May 29th, 1884. Dear Pensie: Bright be your future lot, And bright the stars above thee. And brighter every coming day, To thee and those that love thee. - Mary Crosby, Cherry Farm, Dec. 25th, 1882. Fall from the ships mast to the deck, Fall from the ladder and break your neck, Fall from the earth to the clouds above, But, never fall in love. - William J. Howard, Cornwall, '83. Kind words can never die - Maggie Lawson?, Nov 17th, '83. Oh, how much more doth beauty beauteous seeing, By that sweet moment that truth doth give, The rose is fair, but fairer we it deem, For that sweet odour which doth in it live - Maria Lawson, June 29th, 1885. Friend Penelope: Lives of great men all remind us, we can make our lives sublime, and departing, leave behind us footprints in the sands of time. - M. (Maria) Farquharson, Mt. Herbert, Christmas, 1882. To Miss P. Hyde. She's arm'd without; that's innocent within. - D. Bears, Dec. 28, 1882. To Pensie: The older the tree, The harder the bark, The older the man, the harder the spark. - John Benjamin Howard, Cornwall, Feb 25th, 1883. Little by little the time goes by, Short if we sing, long if we sigh. - Lottie E. Campbell, Charlottetown, December 14th, 1883. Dear Penelope: May joy and prosperity be always with thee. Whenever in life you may chance to be. - F. McPhail, Clyde River, Dec. 30th, 1882. Love is the rosebud of an hour. Friendship is the everlasting flower. - Penzie Mason, March 28th, 1883. Dear Penelope: May all your years in joy be passed, and each prove happier than the one just passed - Maggie Boyle, West River, Jan 1st, 1883. Reprove not a scorner, lest he hate thee; rebuke a wiseman, and he will love thee. - Thomas L. Hinton, Summerside, Feb 13, 1883. Dear Pensy: Those few lines to you are tended, By a friend sincere and true, Hoping but to be remembered, When I'm far away from yours - Belle Jones, March 7th, 1884. To Pensie: May happiness and prosperity Ever attend your footsteps Is the desire of your friend - Hannah J. Howard, Cornwall, Feb., 1833. A little nonsence now and then, Is relished by the best of men - Adelaide [Hyde], Dec 26th, 1882 [married James D. MacMillan in 1901]. Dear Penelope: Wherever your lot be that home ever blest. And never with sorrow may you be oppressed. May health's rosy tint on your cheeks long appear, And happiness be yours for many a year. Till like a full sheaf of life shall gloriously end. Tis the wish from the heart of your affectionate friend. - Katie B. McCallum, West River, Jan 9th, [no year]. Dear Penelope: With tender affection, Believe me as ever - Bysie Smith, Kingston, March 8th, [no year]. The Penelope: Perhaps in some succeding year Your eyes may rest a moment hear. And memory will bring back to view The one who wrote those lines to you. - Golding Howard, [no date]. Never forget me Pensie - R. B. Norton, April 1, '83. To Pensie: Not like the rose may our friendship wither. But like the evergreen live forever - Nettie Howard, Cornwall, [no date]. If sweet below to minister to those who God doth love. What shall it be to minister above. To show this love Emma L. Haslam?, 23.3.83. Dear Penelope: May you never fade like the leaf But always As the [?] - Lucy Smith, Kingston, March 9th, 1883. Yours with love - Jane Mutch, May 3rd, 1889. Kind Hearts are more than coronets. - A (or H) Moore, Charlottetown, April, '83. Penzie: Your album is a golden spot. In which to write forget me not - Your Cousin, Anna D., [no date]. Voyager on life's sea, to yourself be true, and when'er your lot may be, Paddle your own canoe - Hedley Balderson, North Wiltshire, Dec. 2nd, 1884. Never trouble trouble, till trouble troubles you. - Annie M. Campbell, Ch'town, 26/12/83. Some say that kissings a sin, But I think it wane away?. For there's been kissing in the world, ever since there were two. - J (or T) Ross, [no date].